Meulstroom Lodge combines nature`s tranquillity with the benefit of modern facilities. 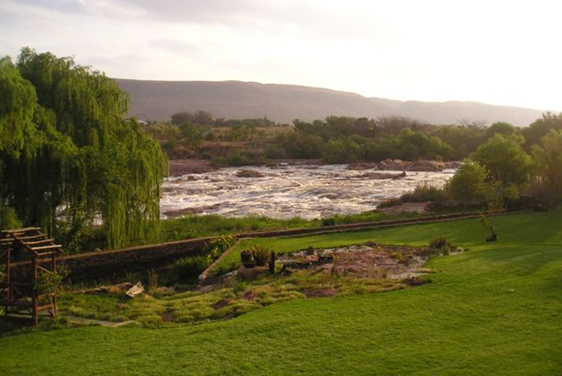 You can relax in the surroundings of the unspoilt nature with the calming sounds of the Wilge River rapids. This creates a very special atmosphere for families or groups to meet, work or relax together. A historical waterwheel at the end of a water stream catch everyone`s imagination. People enjoy the peaceful surroundings, clean fresh air and feel ready to tackle whatever they are here to do. Frans and Vivia Joubert together with their staffs are dedicated to provide you with the best personal service and attention. This hidden treasure is situated on the banks of the mighty Wilge River offering visitors the ideal venue for conferences, weddings, family reunions and functions. It is the ideal place to break away from the hustle and bustle of city life. We are situated at Zusterstroom, 38 km from Bronkhorstspruit on the R25 to Groblersdal , 50km from Witbank and 100km from Pretoria and Kempton Park. PEMBI “Bronkhorstspruit” offers a broad spectrum of conference room layouts in order to accommodate any variety of needs.